I wanted to share this email and photo we received from Jay Worley about taking his daughter Emma on her first fly fishing trip. It brought back memories I have of fishing with my Dad. Thanks for sharing with us Jay and Emma. Hey, I just wanted to send you a thank you for your hospitality while visiting your store. Not sure if you remember but we were in there yesterday morning getting a few items for my daughter’s (Emma) first fly fishing trip. We fished the Upper Toccoa River near Rock Creek. 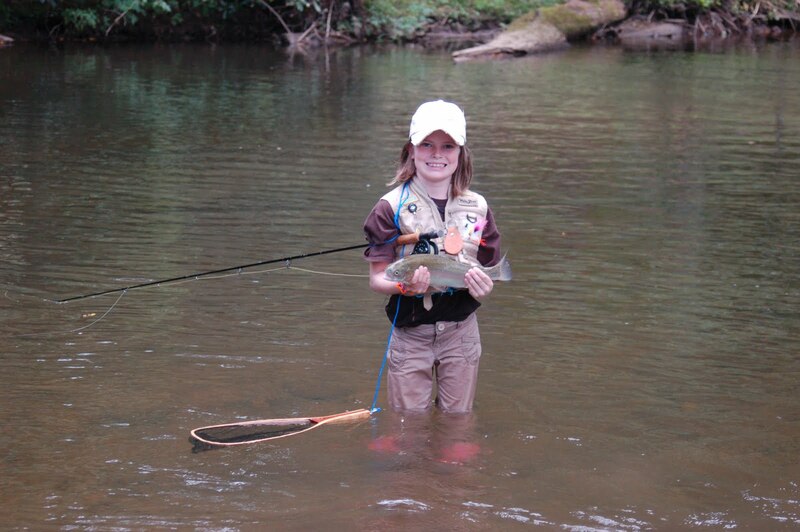 Here is a picture of her with her first trout on a fly rod. She will be the first to tell you that she caught it all by herself and was very proud of it. She was using a Y2K fly because she liked the bright colors and it was easy to see kind of like her crocks that she was wearing. Please feel free to post if you would like. I was probably 25 years old or so before I started fly fishing with my father in law so getting to teach her at a young age is really special. My father in law (Her Poppy) who taught me was along for the trip as well. My son is 4 and his time is just around the corner.